On October 1, The Social Network, directed by David Fincher, arrives in theatres. For the uninitiated, this is the hotly-anticipated movie about Facebook. Peter Travers from Rolling Stone said “It’s the movie of the year that also brilliantly defines the decade.” Trent Reznor and Atticus Ross composed the score and you can download the five-track sampler of The Social Network at Null Co. Maximum Management is excited to announce that we are now working with the one and only Tim Steinruck...a.k.a The Mighty One. Produced by acclaimed metal impresario Devin Townsend (Steve Vai, Strapping Young Lad) and producer Scott Ternan (Jets Overhead, Marianas Trench, Sam Roberts) The Mighty One's eponymous debut serves-up insanely memorable wall of sound hook laden rock with a universal theme of awakening. The first single Reprieved has made impressive inroads at radio on both sides of the border exemplified by the staggering 2.4 million plays at NumberOneMusic.com! The second single Back To You is expected to impact commercial and college radio this September. Stay tuned for more news from The Mighty One and in the meantime check out the official video for Reprieved below. Rad Omen is at it again this week with a FREE download of their full 10-track debut LP,Search Party & Destroy. While you’re picking that up, check out a handful of other freebies, take a minute to admire their awesome website with Topspin integration, and of course don’t miss your favorite fast food chain mascots behaving badly in the Rad Anthem video. 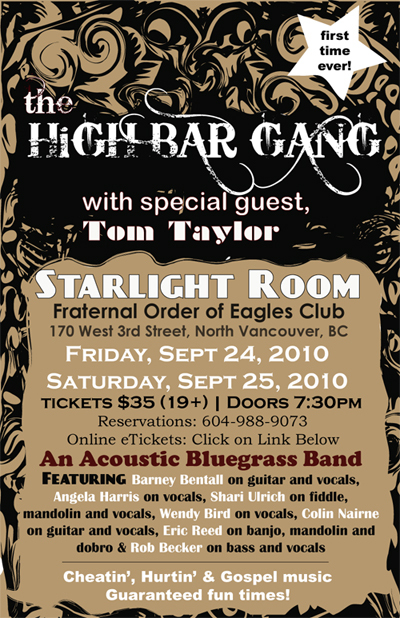 Check out our very own Angela Harris as she performs with the new Bluegrass super-group The High Bar Gang. The High Bar Gang features some of Canada's finest recording artists, songwriters and musicians, namely Barney Bentall on Guitar and Vocals Shari Ulrich on Fiddle, Mando, Vocals, Angela Harris on Vocals, Wendy Bird on Vocals, Colin Nairne on Guitar and Vocals, Rob Becker on Bass and Vocals and the indomitable Eric Reed on Banjo, Mandolin and Dobro.